Broaching Cutters - more accurately called Rotary Annular Broaches - are most commonly used with a magnetic drill so the drill can be taken to where the hole needs to be rather than moving heavy pieces of work onto a static drill. 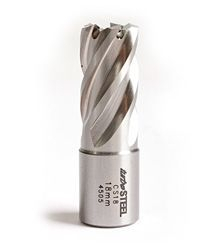 Rotary Broaching Cutters cut a cylinder shape out of the work to form a hole. As this is done with less tool surface area in contact with the work, it is quicker and easier to do than using a standard drill. The 'ingot' from the centre of the hole is also more valuable to scrap merchants than swarf is and it takes up much less space until you can dispose of it. The Saw Shop has a large range of broaching cutters in 25mm or 50mm long and in steel or coated steel. Our broaching cutters are high quality fully CNC ground and produced in the United Kingdom. They have a geometry designed to give you fast accurate holes with the benefit of great tool life. A low vibration cutting edge gives a stable, free cutting action that reduces tool wear.